The new cast of the Hasty Pudding celebrates on Dunster Street shortly after the group admitted women as cast members for the first time in its nearly 200-year history. Hasty Pudding Theatricals has cast six women to perform in its 2019 show, completing a co-ed shift the group vowed last semester and ending an almost two-century period during which only men could act in Pudding productions. Celia K. Kenney ’20, Ellen L. Shaheen ’21, Annabel O’Hagan ’19, Laura Sky H. Herman ’19, Shirley L. Chen ’22, and Ashley M. LaLonde ’20 were selected Sunday night as the first female Pudding cast members in Harvard history, according to an email obtained by The Crimson. This brings the Pudding’s cast — 12 in total this year, per the email — to gender parity. The precedent-breaking announcement came after a long day of auditions and callbacks. Casting deliberations stretched until almost midnight. 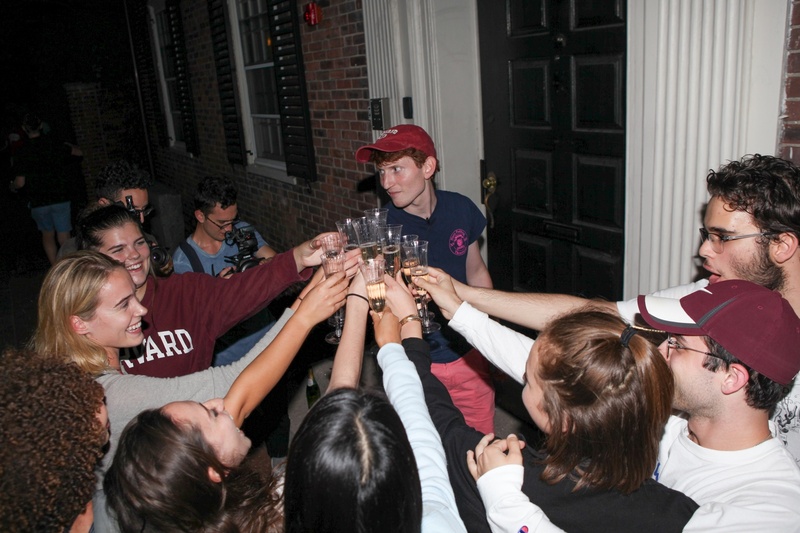 Around 11:30 p.m. — soon after Pudding leaders informed the 12 chosen students of their selection via email — members of the company could be seen leaving the group’s longtime digs in Farkas Hall to head to the Pudding’s campus clubhouse, where they toasted the newest cast members with what appeared to be champagne. "We as an organization continue to be in awe of the level of talent of the students on Harvard’s campus, and we are so excited that for the first time in 175 productions, Harvard students of all genders will have the opportunity to showcase that talent on the Hasty Pudding stage," Pudding President Grace C. Ramsey '19 wrote in an emailed statement early Monday morning. The six newly christened female cast members could not immediately be reached for comment. The Pudding declared in Jan. 2018 that it planned to allow women to join its cast, drawing national media attention and spurring female students across campus to vow to audition this fall. Long considered Harvard’s premier theatrical group, the Pudding has maintained an all-male cast of performers since its founding in 1844, though women hold positions on the group’s business, tech, and design boards. Annabel O'Hagan '19 lifts her arm in celebration after being selected as one of the first six female cast members in the history of Hasty Pudding Theatricals. Controversy and questions over whether the Pudding would cast female actors have swirled to the fore in the past few years. Harvard women sought to join the Pudding’s cast at least three times in the last half-decade — and each time failed to earn callbacks. In Sept. 2016, more than 86 individuals signed an alumni petition urging the group to admit female cast members. The Pudding’s declaration that it planned to go co-ed came mid-way through festivities held to honor Mila Kunis as the group’s 2018 Woman of the Year, an honor the company bestows on a different celebrity each year. The Golden Globe-winning actress may have played a role in pushing the group to change its policies. Kunis phoned at least one member of the Hasty Pudding Institute’s graduate board to discuss adding women to the cast hours before the group made its announcement. And, during a later press conference, Kunis said she would not have participated in the Woman of the Year festivities had the Pudding not chosen to cast women. “I would not be here otherwise,” she said. Former Pudding President Andrew L. Farkas ’82 wrote in a letter at the time that the company had decided to go co-ed “some time ago” and chose to keep the decision quiet until the Woman of the Year celebrations. The Pudding is one of several campus performing arts groups to open their doors to individuals of all genders in recent months. The formerly all-male a cappella group the Din and Tonics accepted its first female member over the weekend. The Radcliffe Choral Society and the Harvard Glee Club also updated their membership policies to include people of all genders last semester. Campus social groups — facing an administrative policy that strips privileges from members of unrecognized single-gender final clubs and Greek organizations — are also increasingly adopting gender-neutral membership practices. Harvard’s sanctions, which took effect with the Class of 2021, bar members of these groups from holding club presidencies, varsity athletic team captaincies, and from receiving certain prestigious post-graduate fellowships. Several historically all-male final clubs and fraternities promised to go co-ed earlier this semester. Every single sorority and historically all-female social group has done likewise, leaving Harvard’s campus without women-only social groups. A previous version of this article misstated the name of Hasty Pudding Theatricals. It has been updated. —Staff writer Cassandra Luca can be reached at cassandra.luca@thecrimson.com. Follow her on Twitter @cassandraluca_.